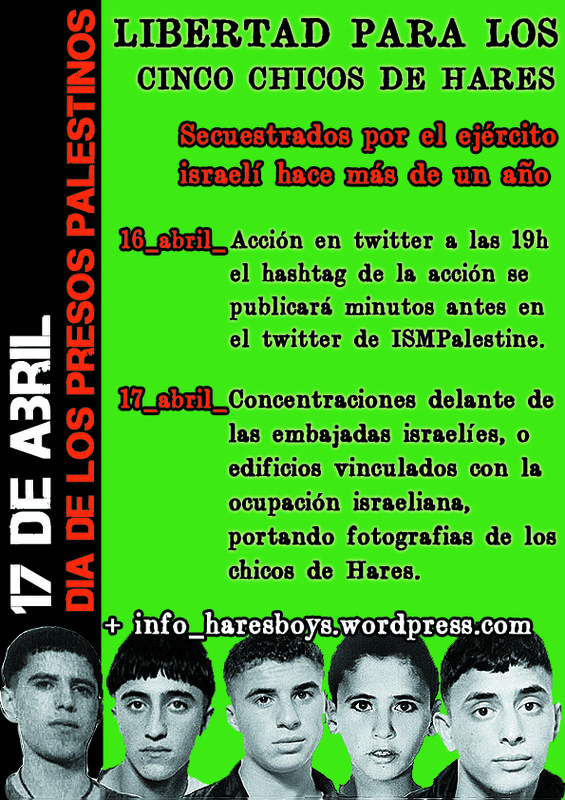 13 April 2014 — FIGHT FOR FREEDOM FOR THE HARES BOYS ON PALESTINIAN PRISONERS’ DAY! 17 April, Palestinian Prisoners’ Day, is a global day of action for Palestinian prisoners. 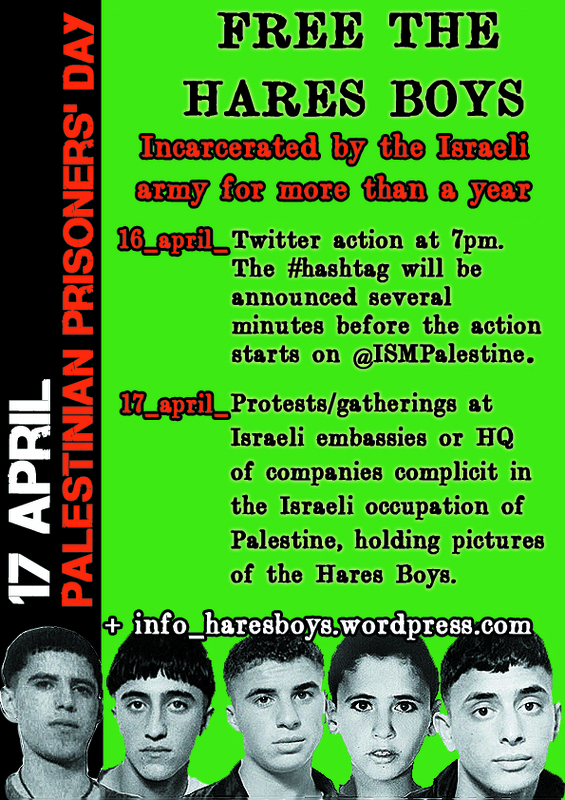 Join in demanding justice for the Hares Boys, as well as all Palestinian children incarcerated by the Israeli regime. 1. Organise an event – a sit-in, a demo, a protest, a silent dance, anything – in your home city at the Israeli embassy or buildings of significance to the occupation (e.g. G4S, which is complicit in torture of children) with a poster of an image of the Hares Boys (here) or your own message of support. Then please email your photo/video to the International Solidarity Movement (palreports [at] gmail.com) or post it on the Hares Boys facebook page. All pictures/videos will then be collated to demonstrate to Israel and the world the international backing that the Boys have. 2. On 16 April, the day before the Prisoners’ Day in Palestine, we are planning to coordinate a Twitter action. We ask that you join us on Wednesday 16 April at 18:00 UTC/GMT for one hour! The Twitter hashtag will be tweeted from the ISM Twitter account as the action starts so please stay tuned! We would like to thank you and hope you can support this campaign in some way.